Free Shipping Included! Coleman Powersports 196cc/6.5HP CT200U Gas Powered Trail Bike - Camo with racks by Coleman Powersports at Kart Racing Network. MPN: CT200U-Camo. Hurry! Limited time offer. Offer valid only while supplies last. The Coleman Trail200U (CT200U) is a nostalgic, reliable, affordable off-road trail mini bike that will take an adult back to their childhood. 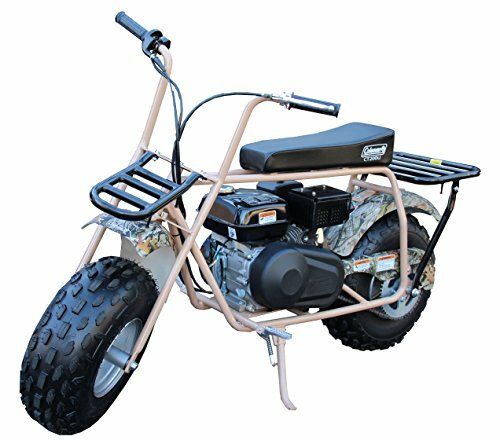 The Coleman Trail200U (CT200U) is a nostalgic, reliable, affordable off-road trail mini bike that will take an adult back to their childhood. Carrying racks on the classic design give you a great look with added utility. The Coleman mini bike will provide years of fun on the trail for the entire family. It comes with easy pull start operation, 196cc engine, low pressure tires for a soft and stable ride, rugged and proven clutch, jack shaft, and chain drive along with rear drum - handle operated braking system.